A delegation led by the Council of Agriculture Minister Tsung-hsien Lin on March 5 visited retailers in Japan that have been selling Taiwan-produced agricultural products, after it concluded the two-day business trip in Malaysia. During his trip, Minister Lin visited Ebina Highway Service Area (SA) market, where Taiwan-produced products such as bananas, banana boat-shaped cakes, chili oil with Taiwan’s sergestid shrimp and Taiwan’s tilapia are sold beginning from 2018, as well as the marketing channels of Japan’s Farmind Corporation, which had signed a letter of intent in 2017 with Taiwan’s Mitagri Co. The Ebina Highway Service Area, one of the largest freeway service areas in Japan, attracts more than 20 million visitors each year. 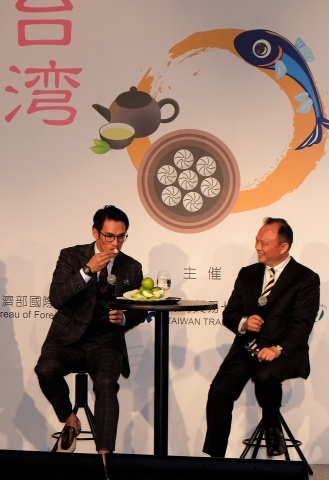 Speaking about Taiwanese agricultural products that export to Japan, Lin said that Taiwan-produced agricultural products are usually well accepted by Japanese customers as the two countries have been friendly to each other. Lin said that Japan is the second largest export market for Taiwan’s agricultural products as agricultural products such as jujubes, banana and tilapia exported to Japan in 2017 reached US$ 868 million, accounting for 17.4 percent of Taiwan’s total export in the year. The Farmind Corporation, which runs 14 operation centers in Japan, mainly centered on services including promoting ripening of bananas, fruit and vegetable processing, import and export of fruit, vegetable and flowers, development of systems in areas related to fruit and vegetable products along with after-sale consulting services. Both of Japan’s Farmind Corporation and Taiwan’s Mitagri Co. have signed a letter of intent in 2017 to set a target that the two sides would purchase 10 billion Yen of agriproducts from Taiwan and Japan over the next five years, said Lin on Mar. 6 during his visit in Japan. Lin said, in line with Taiwan government’s policy, the Mitagri Co. was established last year to help local government to improve agricultural supply chains in Taiwan, adding that through the cooperation with Farmind Corporation, it may further help increase Taiwan’s export sales in agricultural products. More qualitied agricultural products from Taiwan may be sold in local supermarkets, convenience stores and online store website in Japan in the near future, Lin added.